Most of us who are writers of any kind (journalists, authors, bloggers, students, freelancers, whatever) want to write with style. After all, most of us enjoy reading stylish writing. We’d love to be the next Faulkner, Hemingway, or (insert your favorite writer). We’d love to write in a way that expresses our unique personality and grabs our readers’ attention, captivating them with our powerful ideas and soaring command of the language. We’d love to write with such style and power that our readers are attracted to our writing, fall in love with it, and praise it. We want to stand out instead of remaining mired with the majority of bland writers out there. I believe there are two primary false beliefs many writers have about style. Have you fallen prey to either or both of these? 1. That stylish writers are born that way. One either possesses the ability to write with grandeur or one doesn’t. If you don’t come by stylish writing naturally, you’ll never be able to write that way. 2. This belief rebuts the first, declaring “Yes we can!” write with style regardless of our genes. But…it says that developing the ability to do so takes years of intense, painstaking, rigorous learning and practice. It says that anyone can write with style if they are willing to learn the tricks and methods–and put in 50 years or so before the style takes hold. This much is indeed true: some writers are simply (and seemingly naturally) much, much better than you or I or most of our fellow scribes. Why? Who knows? Who cares? Let’s focus on us right now (that narcissism thing again, you know). 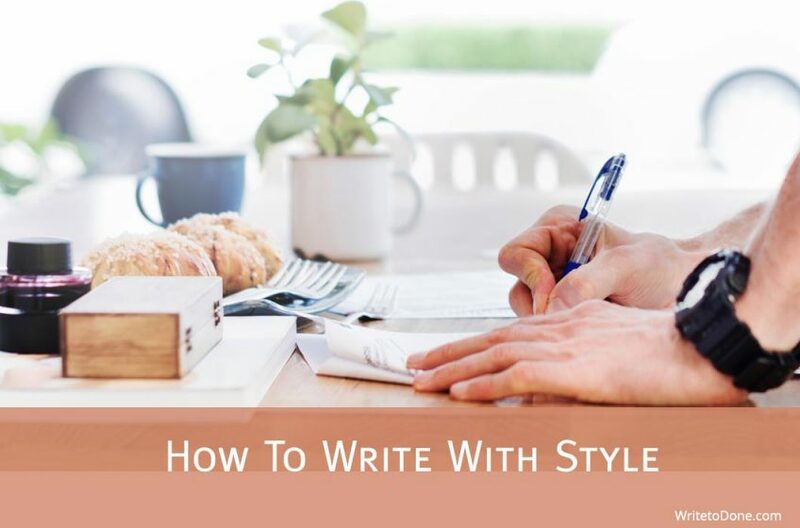 You can write with style, right now (and skip all the writing tricks books and decades of painful practice), by following these three easy ways to write with style. Really. Writing with style is not that mysterious or hard to do. Doubt me? Here we go. The truth is, we already write with style–our own style. Think about it. Some of your favorite writers may not necessarily write all that beautifully and majestically, but they have an interesting personality, strong views, and an ability to connect with you. That’s really all you need to do: be yourself. Write the way you naturally speak–that is your unique style. It’s you coming through the words to your readers, who eventually, will come to recognize your way of communicating as unique to you. Compare the two authors I mentioned earlier, Faulkner and Hemingway. They have very different writing styles, but they’re both highly regarded. Faulkner wrote long, descriptive, ornate sentences; Hemingway wrote short, to-the-point sentences. Each man’s style worked for him. So should yours work for you. As long as you have something valuable to say, just say it in your own voice, and as time rolls on, you’ll find that you’ve developed a writing style you can call your own. And that’s style. You’ll need to pair being yourself with point number two, though, for this to really work. The solution? Do not try to write with style. Ever. You almost never will when you’re really trying to. As noted earlier, you already have a style. You already have words you like to use more than others, words that come naturally to you; you already have expressions you love or temperaments you write in (maybe you’re a happy-go-lucky, inspirational type or maybe you’re a low-key, matter-of-factly type). So let that be that and, instead of fussing about with particular words, just focus on expressing your meaning as clearly as you possibly can. Write so that your readers know exactly what you’re saying. When you consistently combine your unique personality (which we all have) with a clearly stated (worthwhile) message, trust me, you’re well on the way to writing with style. It’s when we deliberately set out to impress our readers with our flourishing prose that we begin to over-think every little thing and stifle our creativity and personality. Forget it. Just write exactly what you want to say so that anyone can get it, and let the style take care of itself. By reading regularly and widely, you organically expand your vocabulary and become aware of many different ways of joining words and phrases together. If you’re in the long-time habit of voraciously reading, you’ll find that as you write, your mind will, naturally, produce more stylish ways of expressing things. You won’t have to hunt through the dictionary; you’ll be drawing on much wider and richer varieties of expression–without the painstaking effort. But you have to read for this to happen. And you have to read books and magazines that run in-depth feature-length articles. Why? Because that’s where you’ll usually find the best writers. These folks are getting paid (often pretty good) while most bloggers are not. Again, reality time: it’s usually big news when a blogger gets a book deal, but no one cares when a book author starts a blog. Yes, read blogs, such as the one you’re reading–Write to Done is a very good resource for writers. Blogging has its own style (which all writers need to be aware of), but perhaps because of the skim and scan nature of the Web (and the fact that anyone can publish on a blog), the level of writing and scope of vocabulary in the blogosphere usually isn’t as high as it is in magazines or books. Also, by reading many different writers, and really engaging in their ideas, you enhance your critical thinking skills as well as your imaginative firepower, both of which enable you to develop a richer personality, which is what you really want to shine through in your writing anyway, as we noted in point #1. See? Writing with style isn’t that hard. You don’t need to tackle all kinds of writing textbooks or spend years penning away before you can even begin to stylize your prose. Really, what’s easier than being yourself, saying exactly what you mean, and reading? There are other ways, of course, to write with style, but we’re talking about easy things here, things anyone can do right now. Do you know of any other easy ways we can write with style? I have just discovered your great blog and am going to direct my students to it. You make some great points about being yourself, originality etc. Now there is a particular and peculiar dynamic going on in high schools of course. Whilst many of the marking criterions place “Flair and originality” as the top of the grid, many students are also spoon fed a mass of interpretations, and somewhere in the mist they are told to be “original”. I have a number of students who are highly original and their respective classroom teachers of English, keep telling them to stick to the notes. yeeech. So there’s a push for our students to “conform” and when real originality shines.through..there are some who just don’t recognise it, are insecure with it, it just does not fit the “mould”. Makes me wanna holler!!! Lets face it. Great writing begins with great ideas and lateral thinking. knowing full well that when these bright sparks get back into their classrooms someone keeps telling them to dim the lights. Crank up the high beam I say, stomp down on that pedal, and run over the idea killers. Truth is stranger than fiction. Yes? I definitely agree with the tip about how trying to write with style tends to be counterproductive. Reading a lot does help. Early on, my writing tended to emulate the style of whatever author I was reading at the time, but as I’ve read more and more writers and written more and more of my own work, I’ve noticed my own particular style coming out. I believe that writing with style is innate in every writer. It just needs proper guidance, experience and exercise to develop that “unique style” within each writer. I love research papers and every time I write one, it seems that there will be no unique style from me since the tone is serious and its for academics. But soon I’ve discovered that even if it’s an academic paper, I can still show my style. To achieve the excellent style tips here, I’d add: write it like a letter home. Works every time. Thanks for the sturdy encouragement. This really helped me put things into an order! Trying to write more is definately helping me progress. Your steps are also there helping me! Certainly, yes, if we write like we speak, hopefully, we speak well. But, if one normally uses simple (and correct, of course) words instead of bigger, more intellectual words, that’s how that person should write. The more natural their writing feels, the more free they will be to express themselves, and thus, display their unique style. Yeah, the more technical the field, the less likely the writing is to be simple and readable. In general. The style you’ve been experimenting with sounds intriguing. I don’t think I’ve read such a nice examination of style, thanks Jesse. I’m used to write a fair bit when I was in school, but I’ve been a neuroscientist for many years now, writing academic research papers and it’s such an unnatural style. I mention this as an explanation of why scientists are such rubbish at communicating with the public in general – and I’ve certainly found the constraints of academic writing have certainly hurt my free and easy writing style of my school days. So I’ve been experimenting with a sciencey style that’s not in your list above examining the biology of the brain and how you can use good writing to generate an emotional response in your readers. Elements of style, if you don’t have a copy of it, you’re missing out. First, many people worry about style when they should be concerned with removing the excess, the clutter, which tends to find its way into all of our writing- William Zinsser “On Writing Well” tells his readers to break their writing down before they can build it back up. Great advice. I would add one caveat to your advice to write the way you normally speak: speak well. Long ago, a combination of poor writers and poor speakers started a rumor, which became a myth, that most people are talented at either speaking or writing, but not both. Unfortunately, there is some truth to that idea, but it is a self-fulfilling prophesy. If you are conscious of the words and phrases you are choosing, then you can develop your writing ability while you are speaking, and your speaking ability while you are writing. Be wary, however, because the side effect of this is talking to yourself while you type, and speaking with a Shatner-esque cadence. Yeah, it does look like a photo credit. The font should be bigger or there should be an editor’s note to make it more noticeable. Well, that’s cool that you recognized my “style” before you saw that I wrote it. I had a similar experience when I first began freelancing. Same type of stories, same out of element feeling. You just do it, though. It’s the only way to make it happen. Interesting approach to your own style–prayer. I like it. Great to see you commenting here. Yeah, trying to write with style ends up forcing things. Much better, and easier, to simply get our point across and let style take care of itself. That’s it right there; just do it and think you’ll like your writing better. Great to see you posting here. I think “Do not try to write with style. Ever” is important to hear — I agree that it’s usually a recipe for failure…or at least writing that’s difficult to swallow! Wow! What a great post and great list of tips. Insert your favorite writer–for me, L.M. Montgomery (Anne of Green Gables) and Mark Twain. These are the first who come to mind at the moment. When I started freelance writing, I thought I would get some really interesting assignments covering arts events in the community and things like that. Instead, I was asked to write cover stories on health topics for a magazine insert in our local paper. I felt really out of my element. Then we we moved to a different city, I was asked to write a parenting column and could not rely as much on interviewing other people. I had to come up with a lot more from inside myself. In both situations, I dealt with my anxiety and inexperience in these areas by praying hard before beginning each assignment and all the way through each one. I asked the Lord to give me fresh angles and words that would really speak to the audience. I am amazed and grateful for the way He helped me bring things together in unique and interesting ways. I realize your question was essentially rhetorical, but I do recognize my own style/voice (agreed, Anne) when I’m “in the zone.” Often, however, I end up editing out quite a bit of that style on rewrite. Yup, I sure did. I missed your byline because it looks much like a photo credit as formatted and my eyes skipped right past it. In the past there has often been an “Editor’s note…” for guest posters, which is far more noticeable. I’ve read enough of your posts to recognize your voice. Plus, I KNEW this wasn’t from Leo or Mary – each has his/her own style, too, of course! Thanks. Making time to read can be hard for writers; so worth it, though. It’s really helpful to read fiction too–to get away from the normal barrage of fact-based stuff. It’s a different perspective. Good point. We need to read, but we also need to practice–write and write–to develop our own style. You’re welcome. Did you really think “Hmm, sounds like Jesse!” before you saw the byline? Cuz, that would be cool. Indeed, you’ve been there from the beginning–back when I was blogspotting. True. Although, this is my third post for Write to Done. Remember the one about word counts? Thanks for letting me put my own little bit of style up here. Yeah, trying to force a style doesn’t work. We have to be ourselves–it’s so much easier that way, anyway. I think voice and style are essentially the same thing–to me, anyway. We only become good writers by writing, a lot, and being yourself when you write helps that process move quicker. Thank you for this article. I’ve never considered myself a good writer, but I love writing. Be yourself is just what I needed to hear. Great advice… be yourself… it’s so obvious when someone isn’t being them self when they are writing – you can tell when they are trying to force a style. BTW, I think of what you’re calling style as voice. Do you have a different definition for voice? You make it seem so easy. I definitely think the easiest way is by reading other people’s content. Whether this is online or off-line. Either way if you are reading you are definitely going to pick up on some different things and it will build your writing style up. I think reading is always a good way to improve anything about your writing. That being said, one of the things that helped me to identify my own style was learning to speak German. I know not everyone wants to go out and learn another launguge on the spot, but it really helped. I learned to re-form my sentance structure and I got really good at learning to say what I wanted in more ways than one. I also learned how to use words I already knew in new and differnt ways, stretching the capacity of my words. The Elements of Style is the best writing assistant. It’s to the point. There is no fluff. It’s easy to carry around too. Does anyone know if there is a version that can be used on iPhone? As I have been reiterating recently on my blog, we can free our sells up creatively if we think about writing as a process and follow principles like those outlined here. Learn and practice the nuts and bolts of writing and the style will come in time via your personality and tone of voice. I’m trying to read as much as I can these days, I definitely think my ‘skills’ improve after I’ve read a particularly articulate or challenging book. Hi Shanel – that’s a really good idea. I usually have my “Everything Book” with me. Billboards? Will start taking notes tomorrow! Hi Jim! Do you know exactly what your personal style is? My take is that it’s so personal and intimate that we don’t know what our style is. I don’t! And there you are. Proves your point, of course, Well said, Jesse, and worth re-reading. This is probably how I found Robust Writing to begin with, isn’t it? For myself, if I could write in the style I admire most it would be that of my favorite writer: the late, great John D. MacDonald. I’ve read every word of his that I could find, and many of them more than twice. Oh, what I would give to read just ONE more installment in the Travis McGee (“colors”) series! John D Mac had Style, for sure. Thanks for a fine essay, Jesse. I agree with your point on reading widely. By reading widely, we tend to gather enough knowledge of different writing style and finally finding our own. Ultimately, we will still need some hands on practice in order to find our style. What’s ironic, is that style is something that is organic to the writer. Something that happens naturally – not something that’s devised. You make a good explanation of what exactly style really is. It’s just the author writing naturally and using clear language to do so. When we meet people and interact with them, we get to know their personality (‘style’). The same is true for writing. Let the readers get to know you. But they can only do so if you express yourself by being yourself. Also, don’t be afraid to imitate your favorite writers and let yourself go through such phases before you begin developing your own clear voice, if that helps. Almost every great artist of every field (Picasso, Mozart, Mark Twain) began their careers by copy styles they admired. It’s the easiest way to learn. Kids learn that way. From parents and teachers. Then from professors. Jung was Freud’s No. 1 student before he dared to strike out on his own to father his own brand of psychology that in many ways surpassed Freud’s. Socrates taught Plato who then taught Aristotle, each first mastering their teacher’s lessons before developing their own philosophies along the way. The same has been true of writers since ancient times starting with Homer’s Illiad and the Odyssey, both of which amazingly still influence today’s literary themes and styles, thousands of years later! One style that’s impressed me is Dr. Seuss, but then again, I grew up on that. There’s something poetic about it. Poetically insightful. What surprised me is when I read The Dipp, by Seth Godin, is I kept thinking how Dr. Suessishly insightful. It read simply. It read fast. It stuck well. How cool is that?